You are currently browsing the Western Custom blog archives for August, 2013. Ceramic art has been a favorite craft for people of all cultures. During the early 20th century it was a very popular hobby; and, crafters of all ages used it as a form of expression and creativity. With the advent of the Digital age, the abundance of many expressive computerized applications has diverted much of the interest in ceramic crafting, which once was so popular. Ceramic shops are now few and far between. People still have an appreciation for the art, and collectors and flea markets do their part in making the products available to the discerning public. 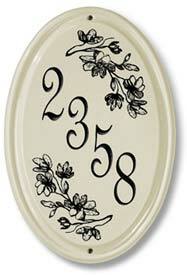 There is some thing about a Ceramic Address Plaque that adds a bit of nostalgic character to a home entryway. Too many plastic and resin imitations have taken the place of the genuine fired ceramic creations of days past. A beautiful theme related, and personalized ceramic plaque might be just the thing to add a special touch of character to your home or surroundings.